Hubble Space Telescope presents a festive holiday greeting that's out of this world. The bipolar star-forming region, called Sharpless 2-106, looks like a soaring, celestial snow angel. The outstretched "wings" of the nebula record the contrasting imprint of heat and motion against the backdrop of a colder medium. Sharpless 2-106, Sh2-106 or S106 for short, lies nearly 2,000 light-years from us. The nebula measures several light-years in length. It appears in a relatively isolated region of the Milky Way galaxy. A massive, young star, IRS 4 (Infrared Source 4), is responsible for the furious activity we see in the nebula. 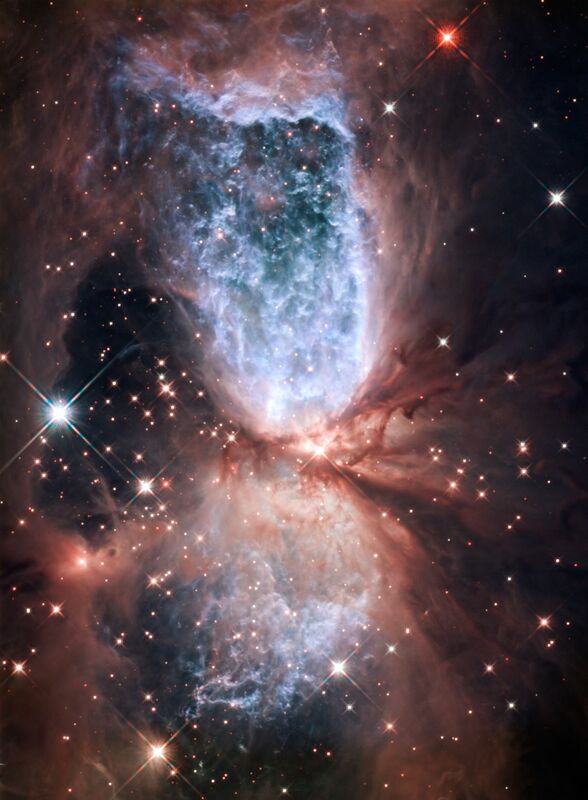 Twin lobes of super-hot gas, glowing blue in this image, stretch outward from the central star. This hot gas creates the "wings" of our angel. A ring of dust and gas orbiting the star acts like a belt, cinching the expanding nebula into an "hourglass" shape. Hubble's sharp resolution reveals ripples and ridges in the gas as it interacts with the cooler interstellar medium. Dusky red veins surround the blue emission from the nebula. The faint light emanating from the central star reflects off of tiny dust particles. This illuminates the environment around the star, showing darker filaments of dust winding beneath the blue lobes. Detailed studies of the nebula have also uncovered several hundred brown dwarfs. 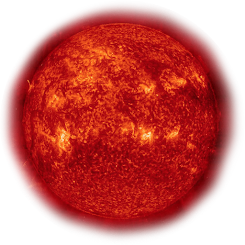 At purely infrared wavelengths, more than 600 of these sub-stellar objects appear. These "failed" stars weigh less than a tenth of our Sun. Because of their low mass, they cannot produce sustained energy through nuclear fusion like our Sun does. They encompass the nebula in a small cluster.